Definition: An acute infection and inflammation of the supraglottic soft tissue structures, which can lead to airway occlusion over a relatively short period of time, typically 2-7 days. Because of the possibility for rapid decompensation to airway occlusion, this is considered an ENT emergency. Incidence of 3-5:100,000 per year. Mortality between 7-20%. Mean age of those affected is 55. Child:adult ratio of 0.3:1. Risk factors include smoking, diabetes, immunocompromise. Broad range of causative organisms, but most commonly caused by various strep and staph species. 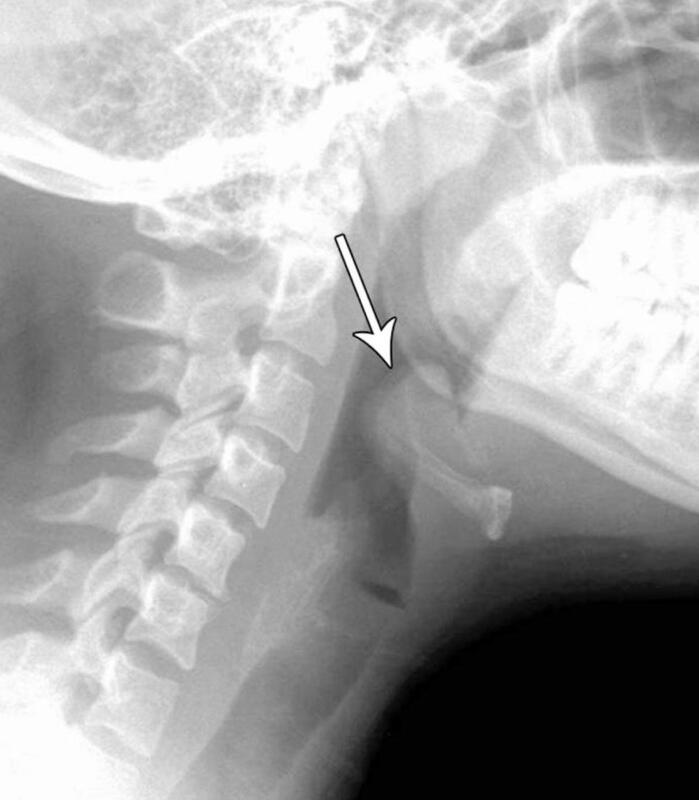 Epiglottitis is difficult to diagnose, and some studies have estimated that it is missed on initial presentation as much as 80% of the time. The initial symptoms of epiglottitis may be identical to a viral URI or strep throat, but can progress to airway compromise over a relatively short period of time. Adding to the difficulty in diagnosis, most patients have no external swelling or erythema. The oropharynx appears normal, since the affected area is out of view in the supraglottic space. NB: maintain a high suspicion for epiglottitis in a patient who comes to the ER for a second time for a worsening sore throat, and any other symptoms of dysphagia, hoarseness, or pain to palpation of the neck, especially if there are no obvious findings in the oropharynx. For patients with advanced inflammation, prophylactic intubation may be necessary. Involve consultants early for a possible awake intubation in the OR, and with preparations to convert to a surgical airway, if necessary. Avoid supraglottic ventilation (LMAs, King LT), as it may compress a distorted or swollen epiglottis. Heliox can improve work of breathing and work as a temporizing measure. Vancomycin should be added for the critically ill patient in whom MRSA is a possibility. NSAIDs for pain and inflammation control. In cases with significant inflammation, steroids are a possible adjunct. Studies on their efficacy in epiglottitis are inconclusive, however. All patients diagnosed with epiglottitis should be admitted for monitoring to ensure improvement. For patients with advanced inflammation seen on laryngoscopy, or patients with any respiratory symptoms, the ICU may be appropriate for closer monitoring. Epiglottitis has demonstrated a resurgence in the adult population. It is no longer a pediatric only disease. Be ready for a difficult airway.